Patrick, the Padre and Wierdy-Beardy came over last night so we could try Ronin finally. 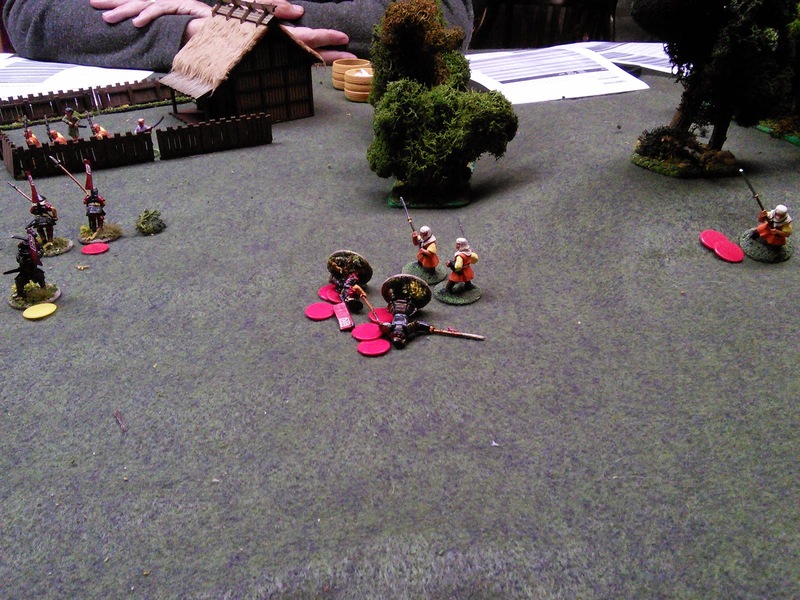 But the Warrior Monks squared off against my troops for control of WB's resin aquarium bell tower that he picked up at the Cold Wars flea market. WB helped me run my bushi while Patrick and the Padre ran the monks. Here I was worried about outnumbering Mikey's monks but the massive qualitative advantage means I need even more troops to take them on. 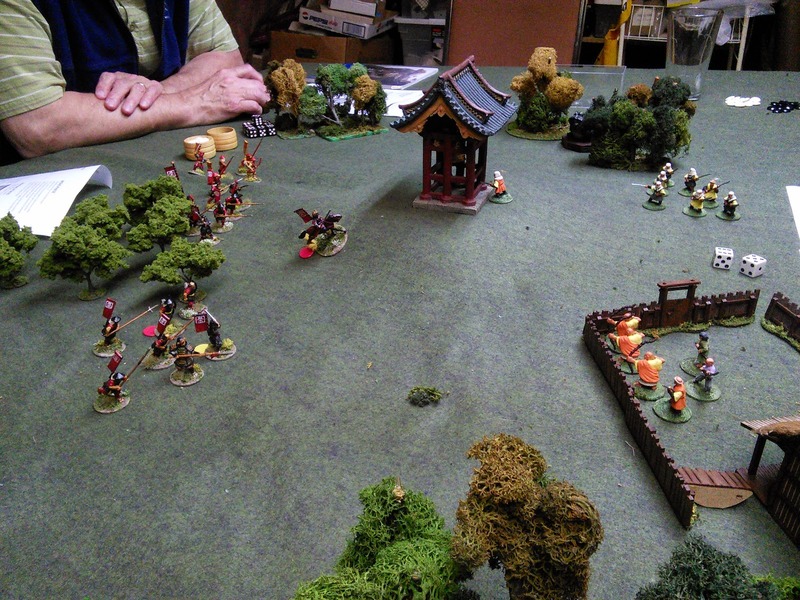 All his sohei are equal to my samurai and he can field all sohei if he wants to (most of his collection are sohei, very few initiates or level 1 temple attendants). 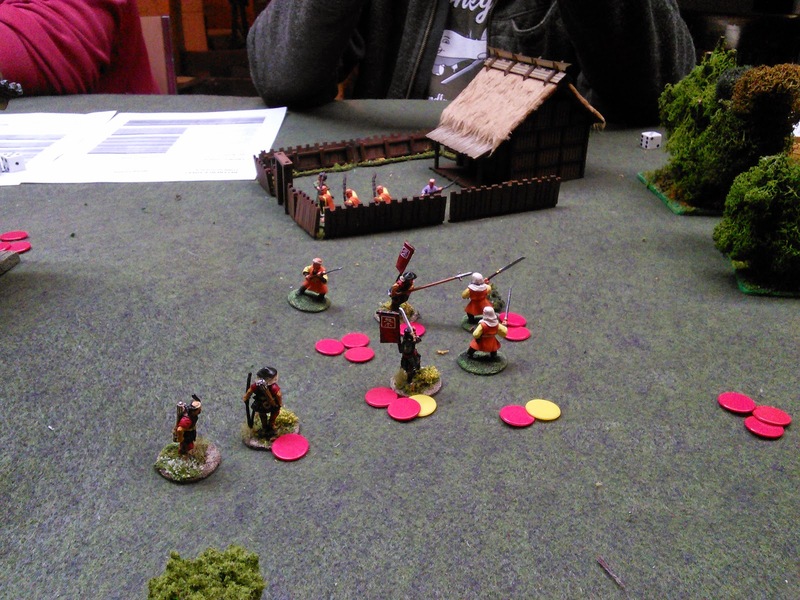 His initiates are slightly better than my ashigaru even! Yikes! 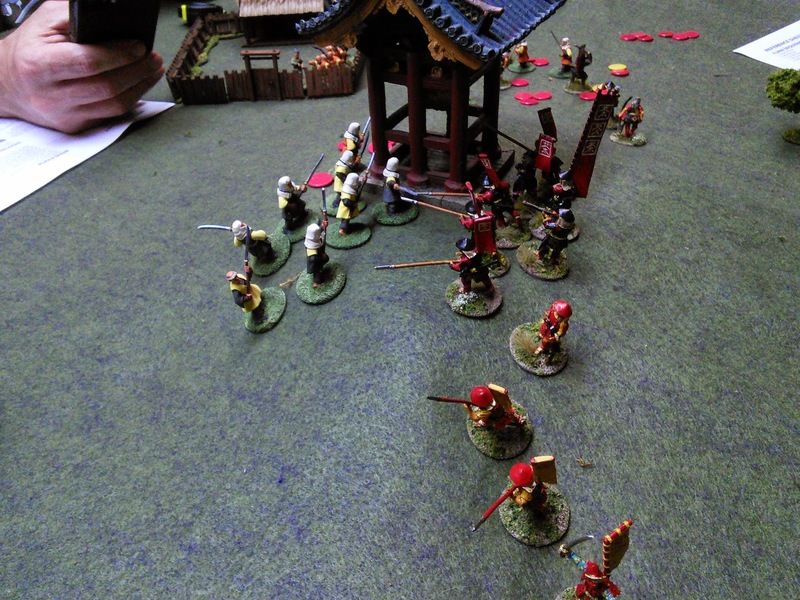 Ronin is a very gritty set of rules. There is a lot of dice rolling. The combat pool and using tokens to enhance attack and defense rolls are interesting. Trying to attack with mounted samurai is confusing and I'm still trying to sort it out. 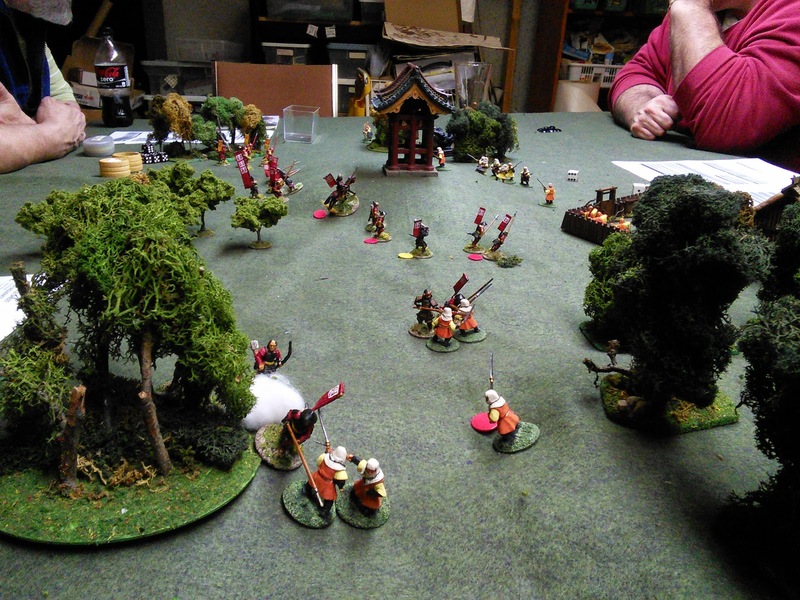 I know samurai weren't shock cavalry like western knights but still I don't think my lvl 4 samurai had a chance against the single monk he tried to ride down. Plus the way the rules are written it seems to say you can't run into combat (i.e. charge). I like the detail for the heroes but for the masses of spear carriers there seems too much detail. These rules are definitely for a handful of figures fighting in a tea house or something. 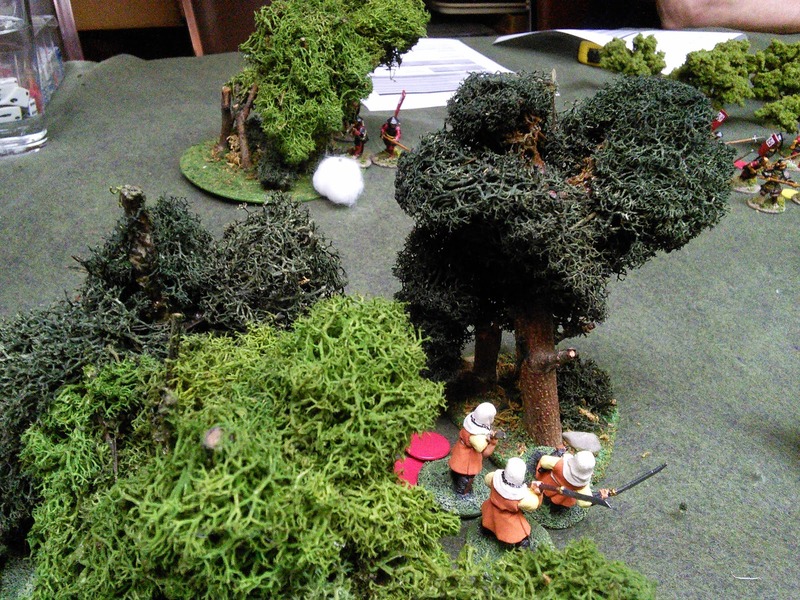 For bigger games I will need to look at something like Sharp Practice or Lion Rampant. A rather banged up metal LAV-25 and a die cast Buffalo mine clearing vehicle from the local discount retailer Giant Tiger. The LAV is going to become an objective. The victim of an IED strike for Coalition troops to secure. The Buffalo is a bit small and missing part of its remote arm, but with a repaint it can lead my trucks and Bisons in convoy for the Taliban to ambush. I just need Elheim to finish the modern Canadians! 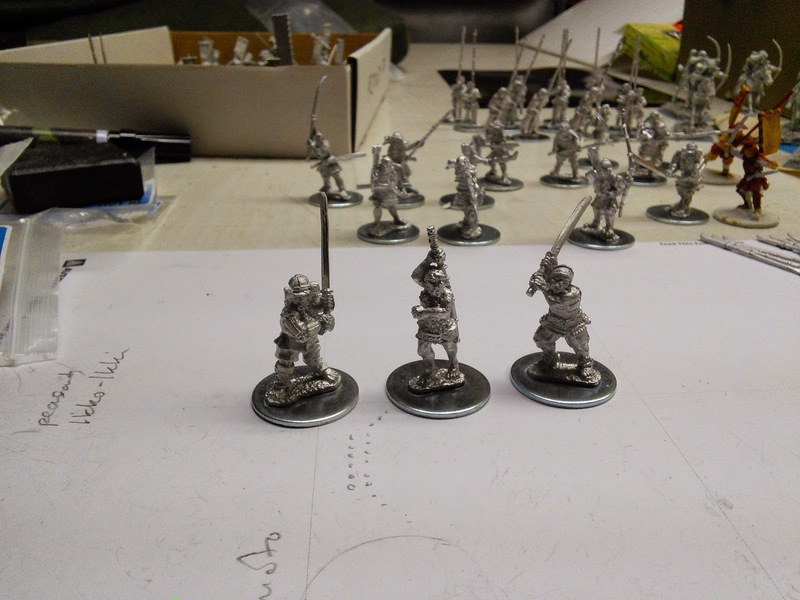 This weekend I finished up some trial figures for the second division for my Samurai. Same mon, just different colours. This time I opted for red lacquered armour and weapons with yellow clothes and sashimono. The samurai of course got more personal latitude in his clothing. The clothes were painted with an ochre base then highlighted with yellow. The sash is a light green. The armour was painted with a brick red base, primary red highlight and then a red glaze washed over top. Everything else was blocked in and then I gave everything except the large armour sections a wash with Minwax Golden Oak to shade. I almost ruined them. I put the final wash on Sunday morning and Sunday night they were dry to the touch so I painted the bases. I got excited and despite a little voice telling me to wait 24 hrs I added the flock being careful not to really dunk the figures in the tub like I usually do, and then one fell over, dumping excess flock all up his legs and onto his thigh armour! Flock was stuck everywhere! So I waited until Monday and with a stiff brush I was able to remove the excess flock and I could add the flowers and tufts. I like the combination, I'm pondering how to rework the yellow and red into the Lord of Tea's hatamoto (household troops). 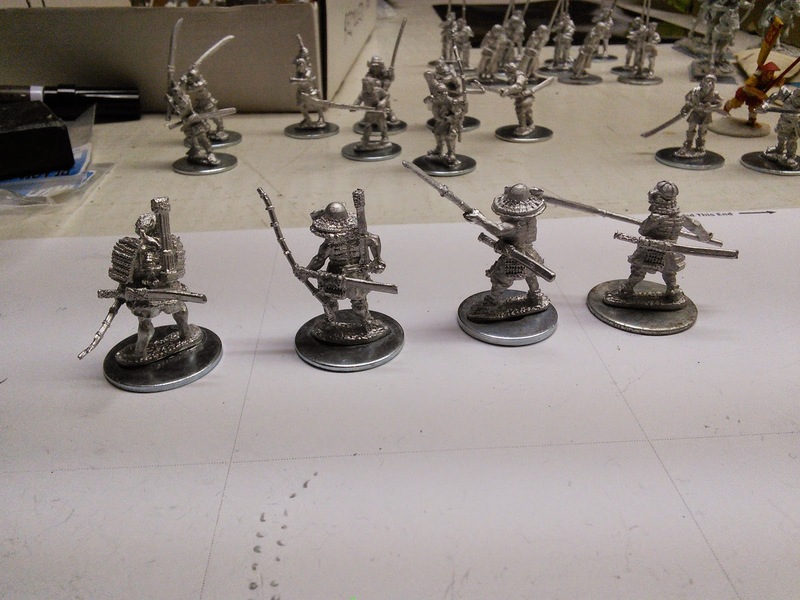 Postman Pat brought a nice little box from Black Hat Miniatures containing a selection of their Ronin and armed peasant figures this week. 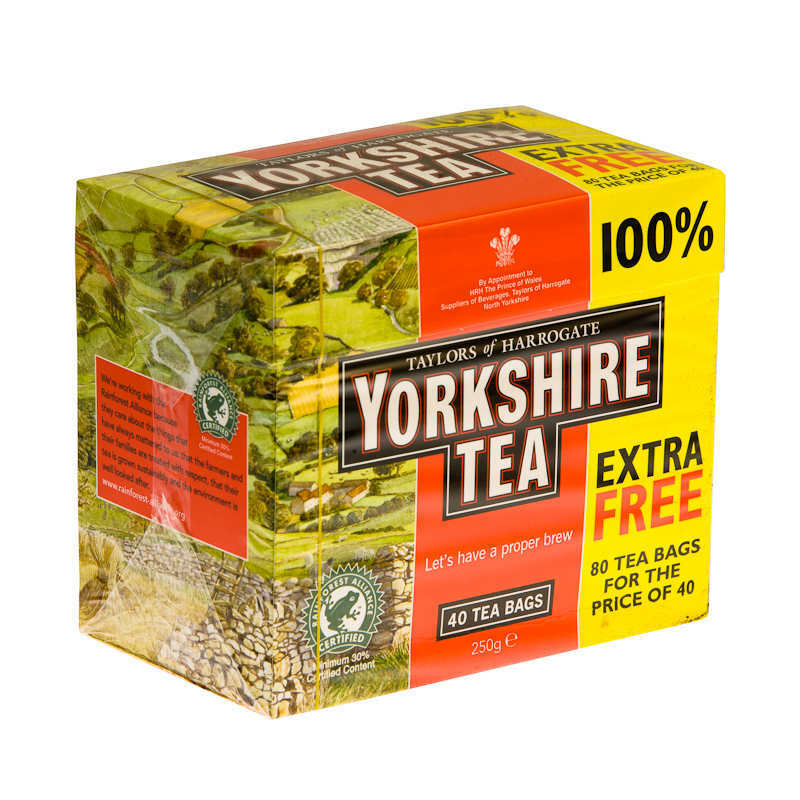 These along with some Ikko-ikki and armed peasants from the Perrys will be used to make a bandit, peasant rebel or Ikko-ikki force to provide an in-house opponent for the Lord of Tea. Or in big battles they are a ready, and expendable, allied contingent. 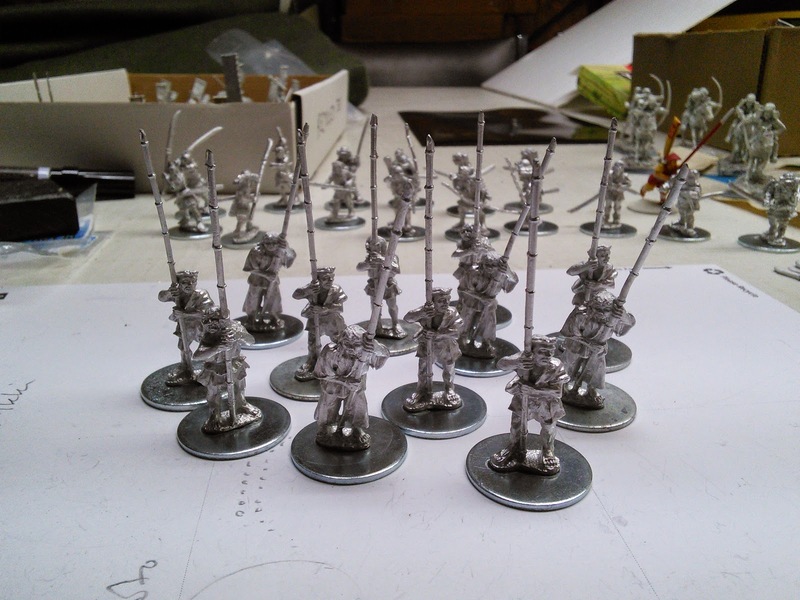 Assuming that is, that I ever find an opposing army of samurai big enough that I require reinforcements. The peasants with bamboo spears have three different figures (one each per bag). They are one piece castings and were pretty good to clean up except for some heavy flash around the ends of the bamboo spears. The bamboo spears are nicely done though. I'm thinking about giving one of them an Ikko-ikki banner. The Ronin are all unique figures, wearing an assortment of heavy but old-fashioned laced armour, some newer helmets, lighter armour or no armour at all. Many of the weapons had to be glued on. All of the secondary katanas had to be glued on to their sashes as well. The katana armed Ronin had their swords cast onto arms that needed attaching at the shoulders. 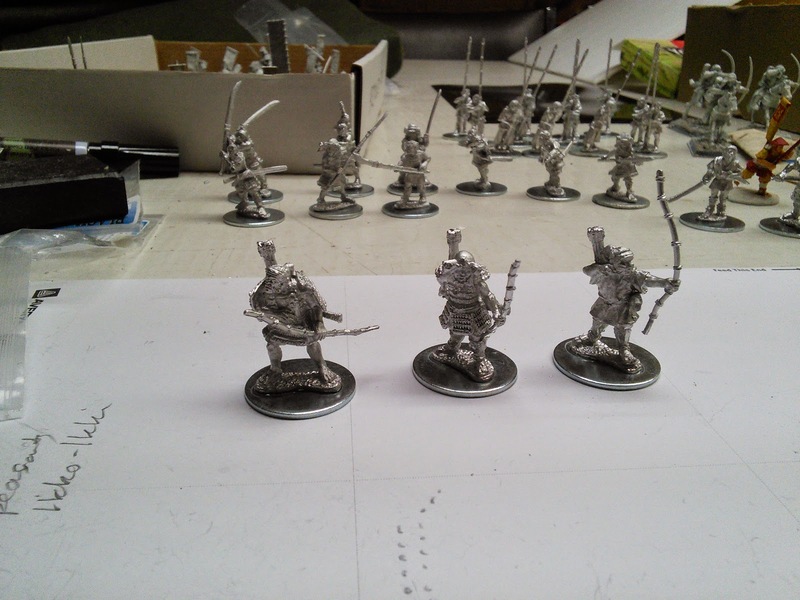 The no-dachi Ronin on the left of the picture, who I think looks pretty cool and might become the captain of my band has both hands cast onto the handle of the sword and then you glue the hands onto the wrists. Well, while I was cleaning up some flash the sword handle snapped. So instead of a reasonably straight forward glue job, I now had three pieces to attach to each other, one of them quite small. I also had to be careful to make sure both hands lined up properly so the samurai wouldn't be holding a bent-handled two-handed sword! I think I succeeded. 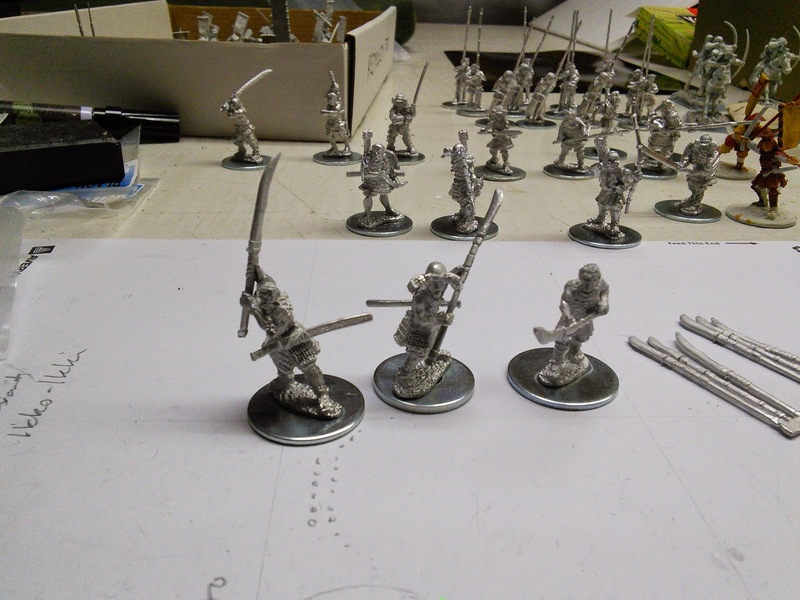 The naginata were also surprisingly difficult to glue. Mainly just trouble getting a good bond, even with gel superglue. As you can see they gave me three sprues of naginata, so I could have my choice of arming each with a slightly different weapon or arming them identically. So far this spring I've been stupidly busy on all the nice days, and when I've had hobby time it's been wretchedly cold (even snowing). 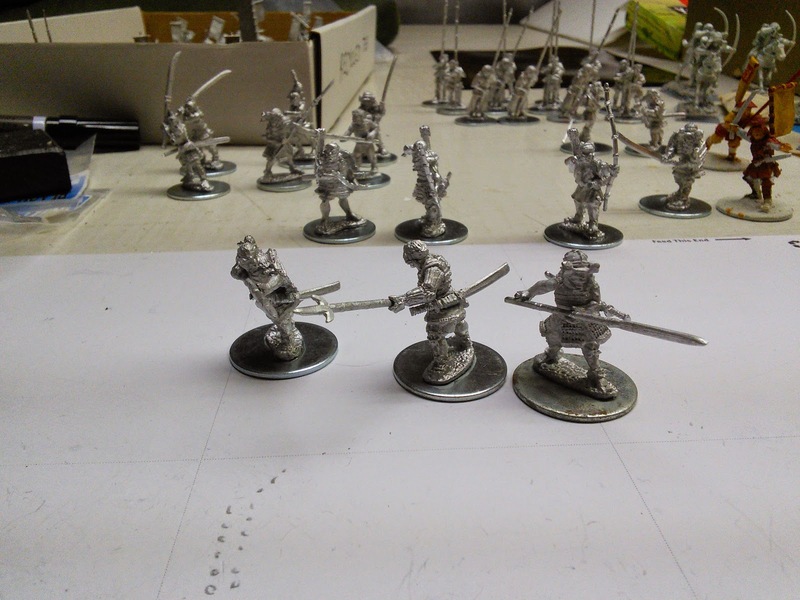 But this weekend is forecast to provide some fine weather for spray priming, so I can get these chaps and my Museum Miniatures baggage train ready to paint. There's a little one day convention in June that J&M is going to be at, and I'd like to run a game of Ronin if I can. I haven't GMed at a show in a long time! 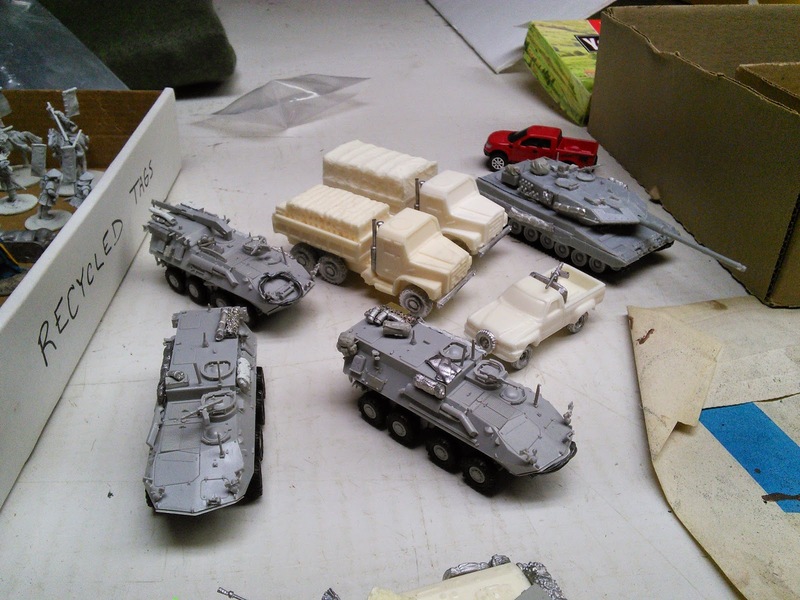 Spent some time yesterday and this afternoon assembling my S &S Models buys that I picked up at Hotlead and gluing stowage onto my Canadian AFVs. 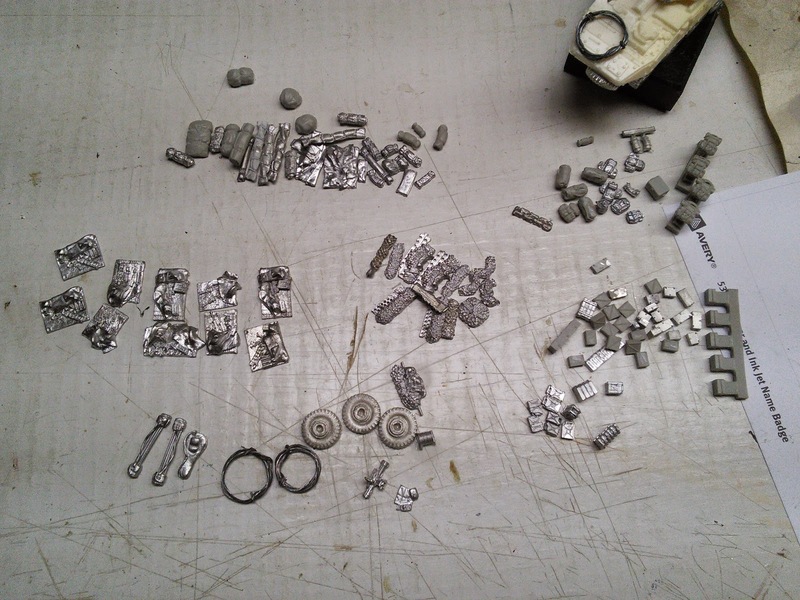 There's the S&S Large Stowage set (50 pcs), some RAFM bits and a set of resin stowage I picked up on eBay. 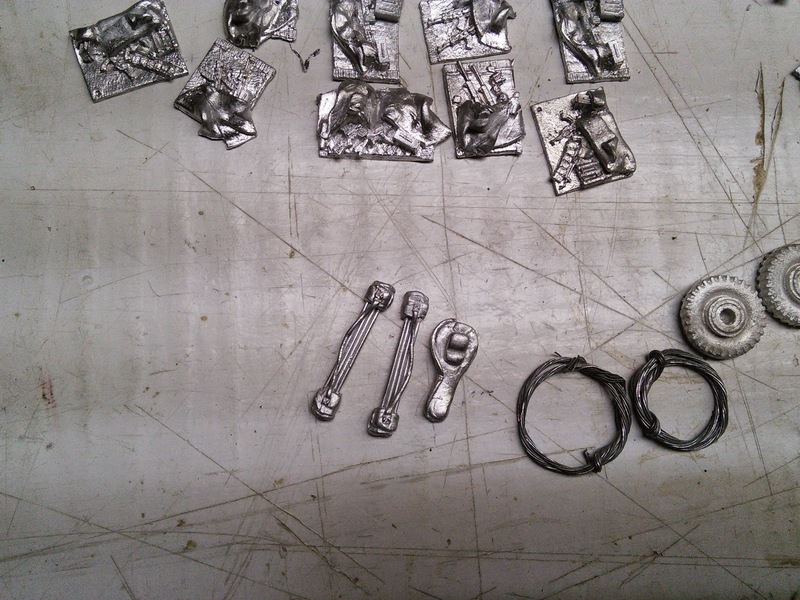 The long thingys and the blobby thing in the center beside my homemade coils of towing cable. Any ideas? But otherwise, I've gotten two 5 ton trucks and a pickup truck technical assembled (good for police or Taliban depending on how I paint it). 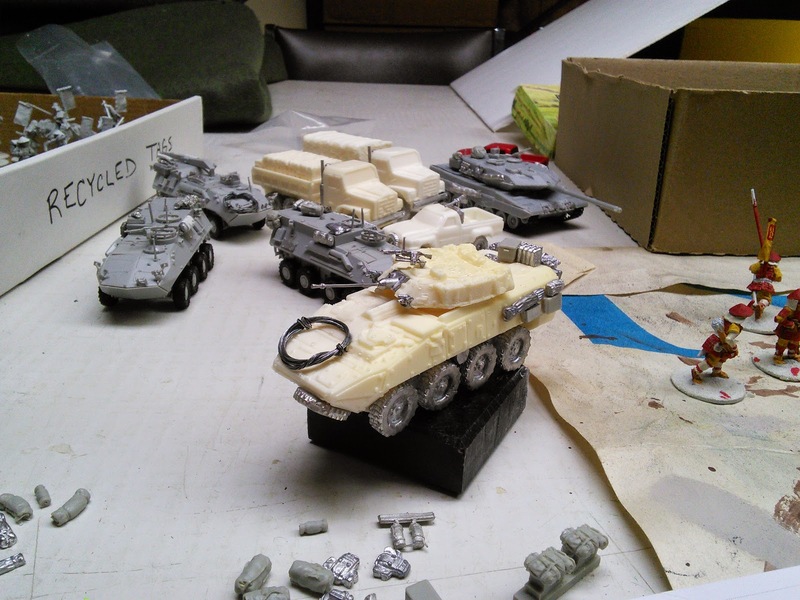 Plus more stowage on the Leopard, the Bisons and starting on the LAVs. 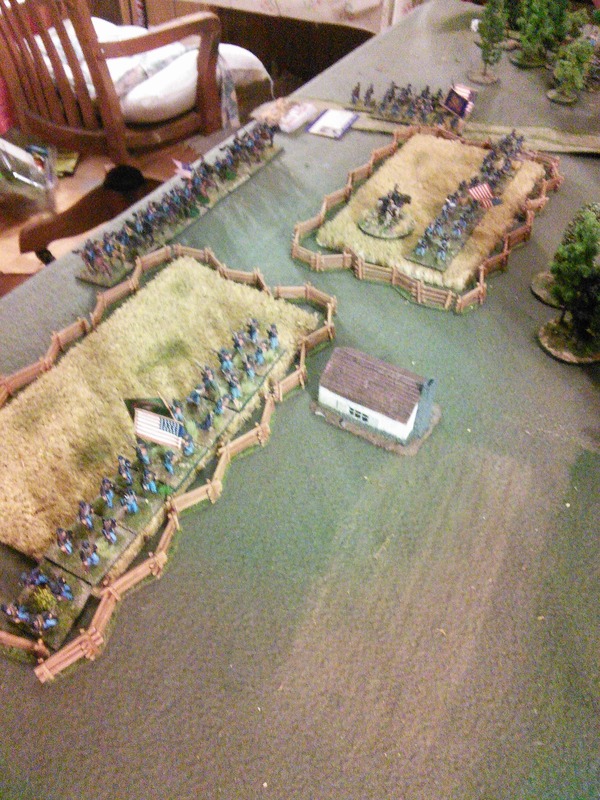 Yesterday the Mad Padre had me over for an Indian take out and some dice rolling. 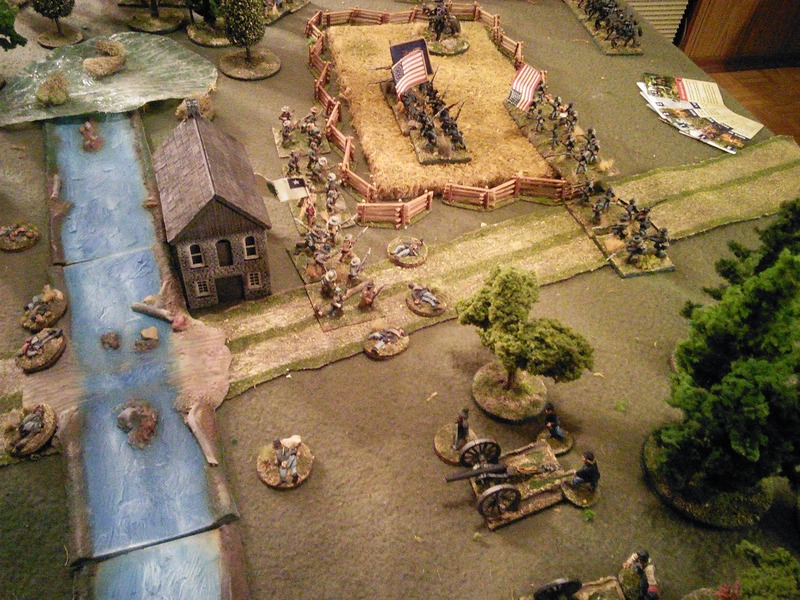 We briefly thought about getting out his new masses of 6mm Napoleonics and learning Blucher, but then decided the smarter course would be to play Longstreet which he has already been teaching himself. 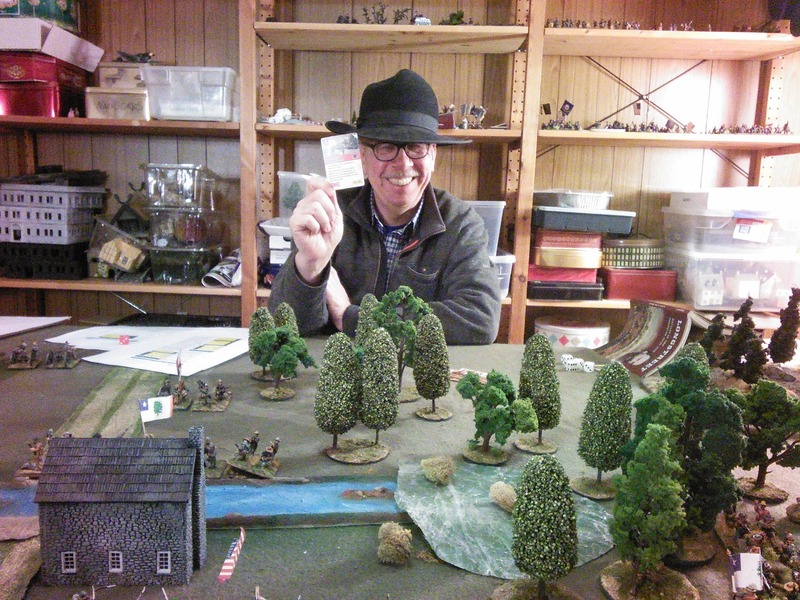 The Padre being a retired ACW re-enactor, we even had the appropriate head gear to wear. We used the terrain generation system of cards to make a table, which ended up having an appalling amount of rough ground in the middle. But it is the Civil War after all. 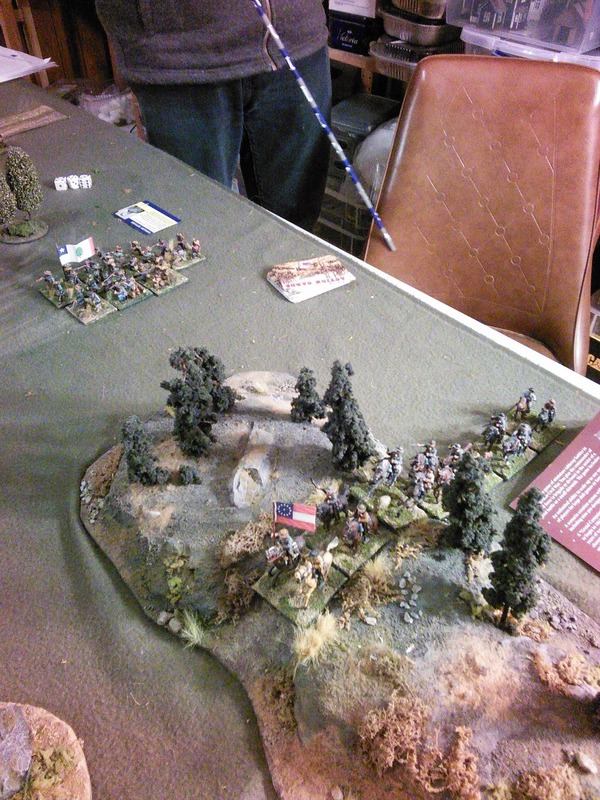 The figures and terrain are all from Mike's 28mm collection. 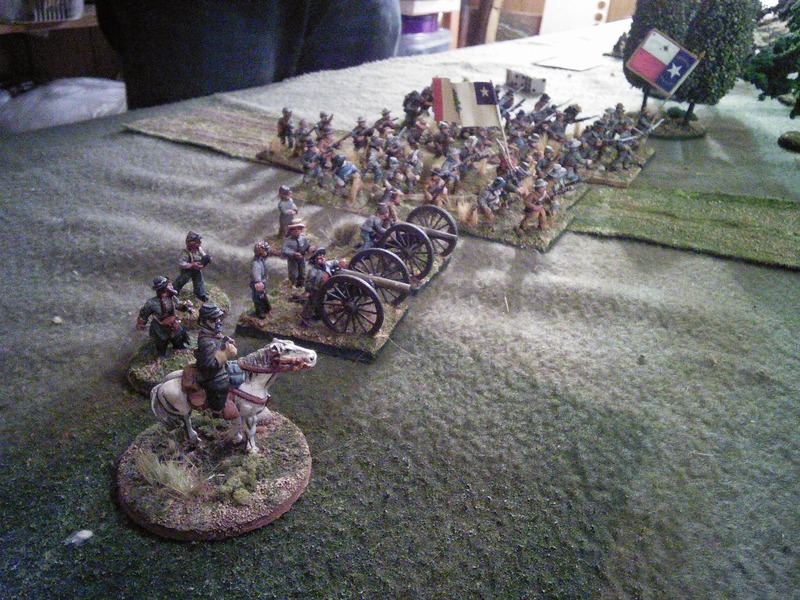 We probably could have doubled the troops on table but my host sensibly wanted to keep things easy to manage. 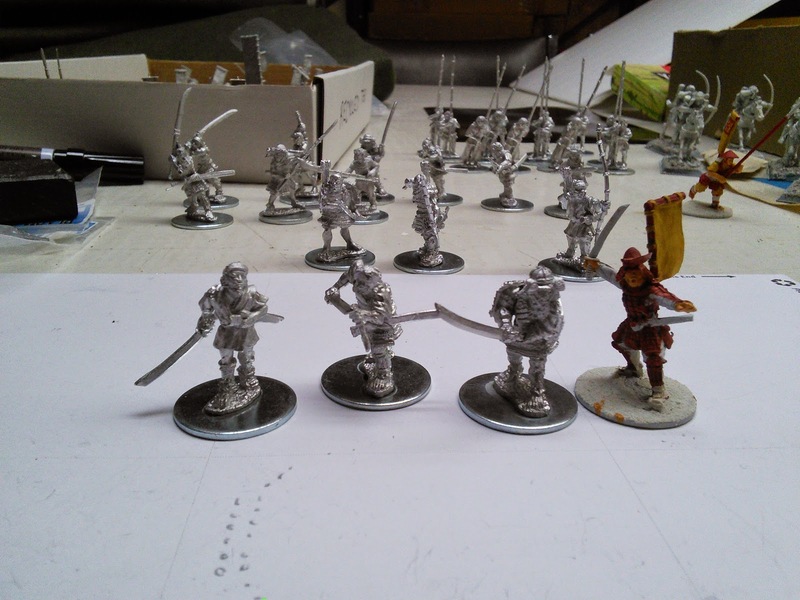 His regiments feature an eclectic mix of old Minifigs and RAFM, Perry plastics and newer sexier sculpts. 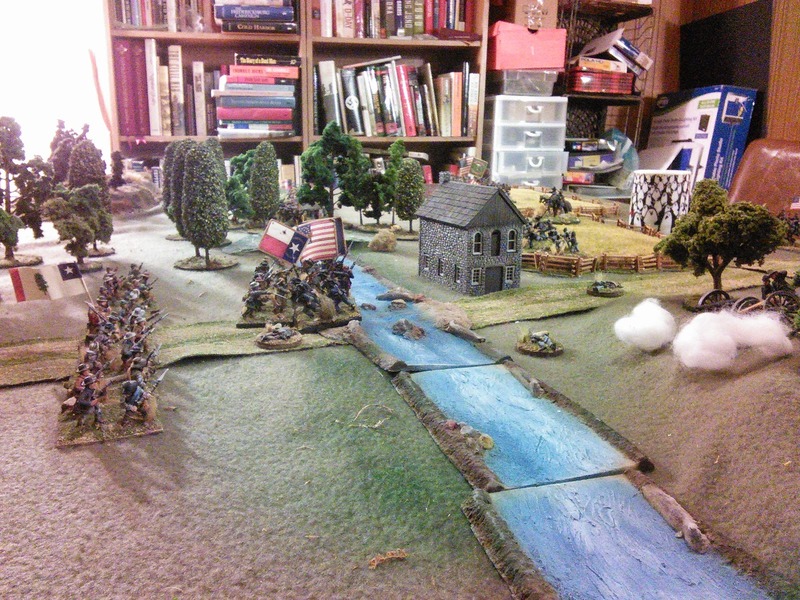 My artillery get game MVP, using their position to inflict a lot of harm on the Texas and Mississippi regts advancing on the mill. Some timely playing of cards to improve their shooting helped too. 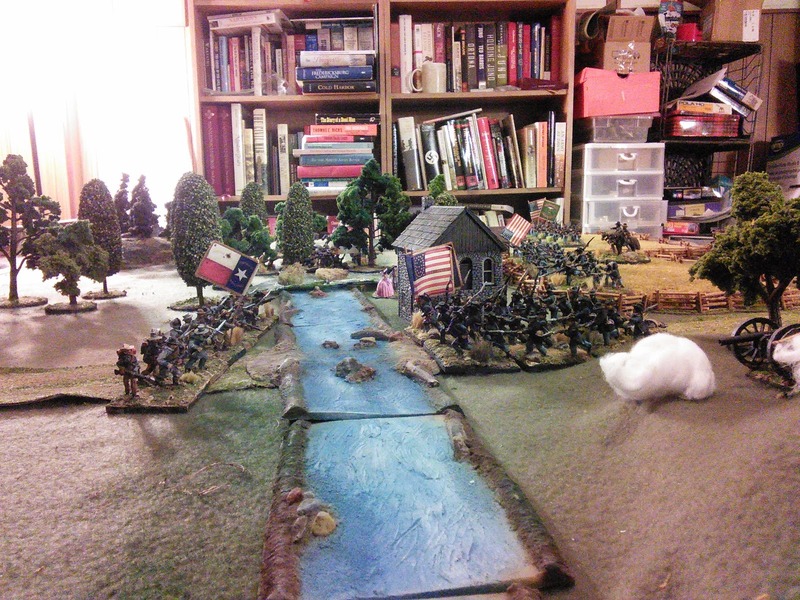 Epic struggle over "Bloody Creek"
I pushed the Texans back with heavy losses, but the Mississippians counter attacked, bundling me back over the creek. 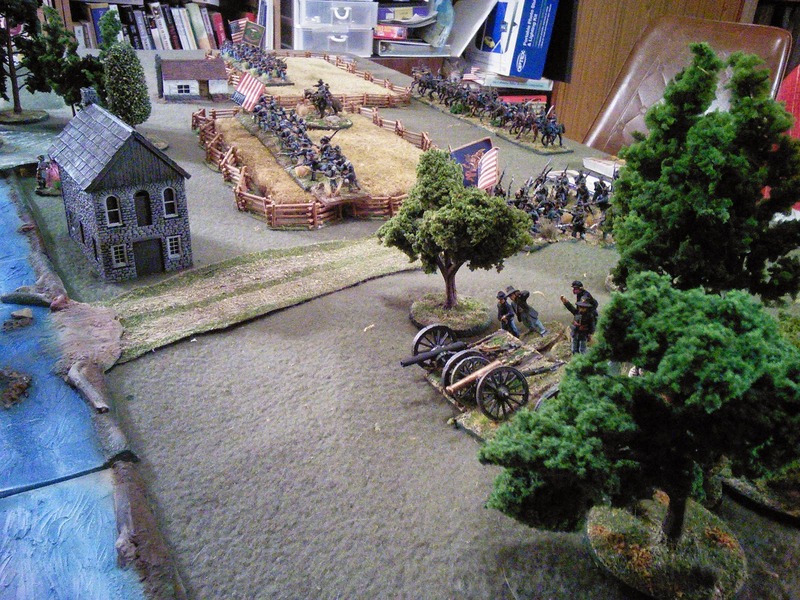 I've lost a gun to counter battery fire, and with the Mississippi regt advancing on their flank it's time to limber up and withdraw. 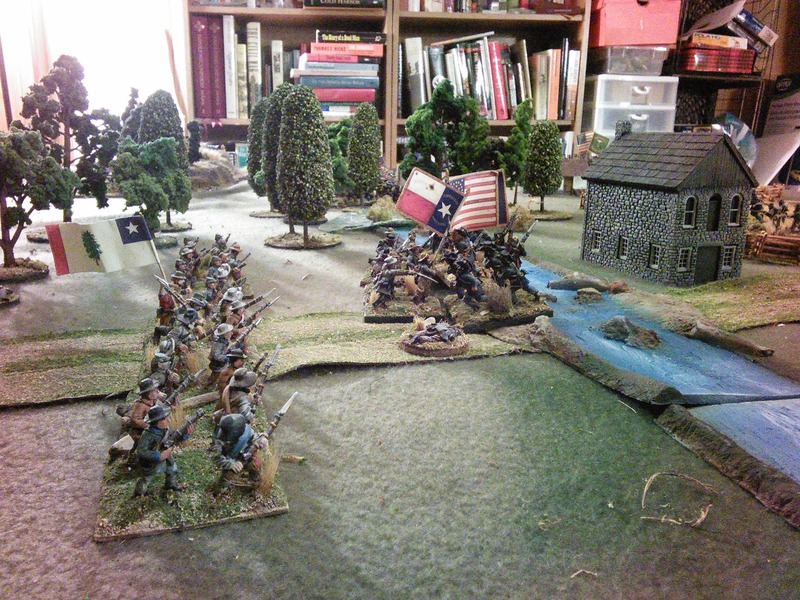 Musketry, artillery fire and hand-to-hand are all pretty straight forward. The use of cards to either modify your die rolls or mitigate hits received adds some chrome. It might seem overly gamey, but I think in a bigger game you're going to have more to worry about so you won't be able to play a card on every combat to effect it. The hand of cards, it's limitations and the management thereof does nicely reflect command problems and where you as the Commander are going to focus your efforts. I also like that there are year specific cards. 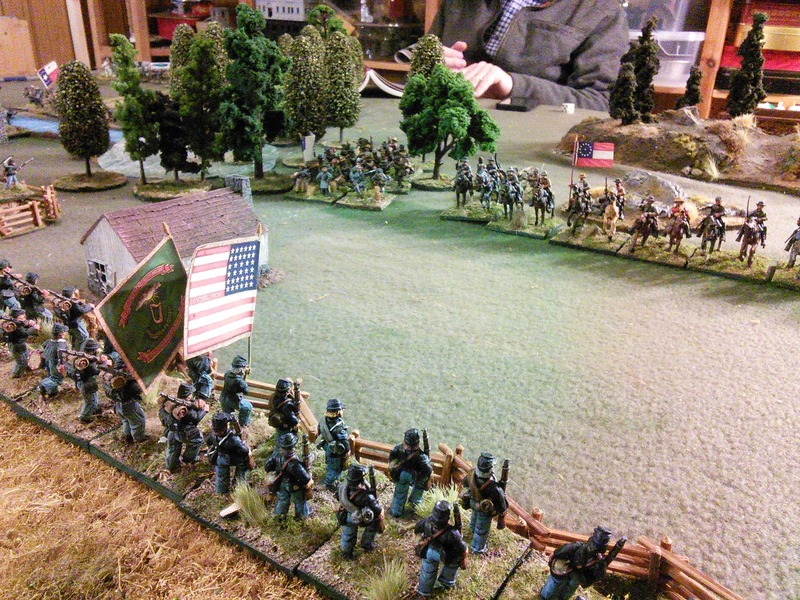 My unfortunate rolling up of 1861 meant the Union had fewer (if any) cool specific to them cards and the Rebs got several (like "Rebel Yell" pictured above). However, if we had rolled up 1864 or '65 then things would have been different. The additional, year specific cards also make the decks different sizes, so in the early war the Union deck runs out faster, and each time you hit the end and have to reshuffle you remove six cards. When you have no cards left then your army is exhausted and you withdraw. 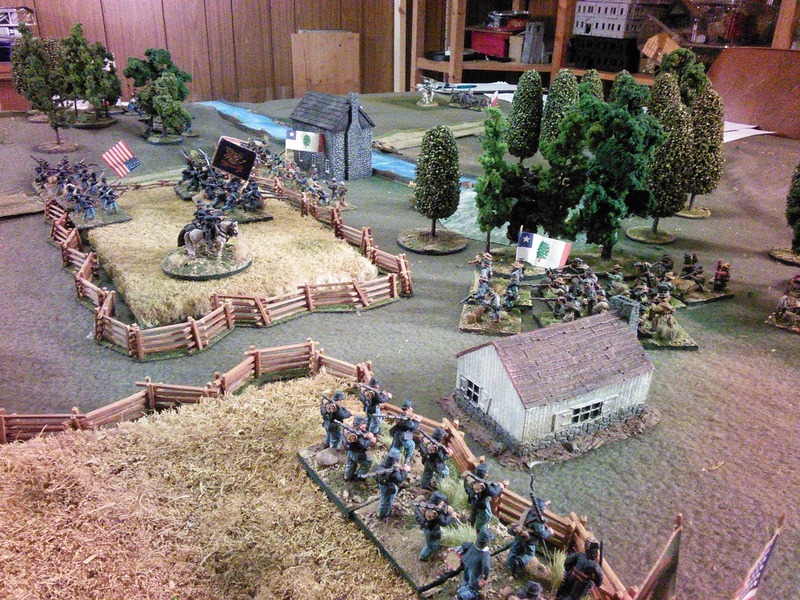 Obviously, later in the war the Confederacy has the smaller deck. 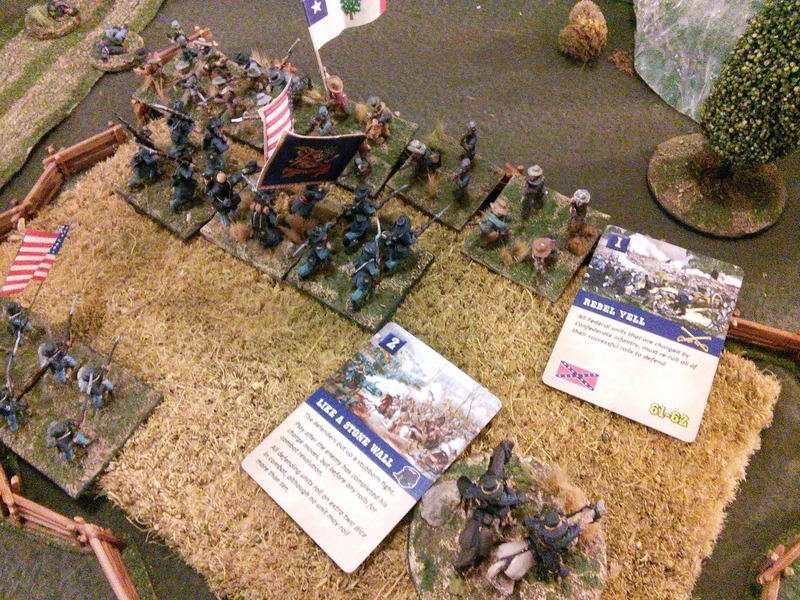 All in all, I quite enjoyed the game and could see it easily scaling up to bigger battles using the other Mike's 15mm Fire & Fury armies.